In January of this year I wrote the following about Matt Leinart’s performance in Tennessee this past season: “Leinart played decently in [Tennessee], but really just kept his team in a position to win, though it didn’t work out that way.” At the time I wrote that, it was clearly meant to be critical in the “glass is half empty” kind of way. As I continue to consider that performance (21/31; 220 yards; 67.7% completion; 0 TDs; 0 INTs ) the glass starts to slowly fill up. Does this mean that I’ve lowered my standards to accomodate Leinart? I don’t think so, but it’s possible. I think it’s more likely, however, that I’ve become more realistic by aligning what I want the Cardinals 2010 offense to look like with what it probably will look like. That process makes me feel better about Leinart and the offense as a whole. I’ve said a number of times that I don’t expect the Cardinals to blow teams away on offense anymore. If Leinart “keep[s] his team in a position to win” every game of the season, I would certainly take that. Excellent quarterback play may be the fastest route to a championship, but teams have gone to and won Super Bowls with adequate, mistake free quarterbacks, the most recent being Rex Grossman with the Bears and Trent Dilfer with the Ravens. There’s fine print under the “No Pro Bowl QB Needed” advertisement, though; it reads: “Exceptional Defense Required.” Defenses like the 2000 Ravens and the 2006 Bears. Well, the Cardinals won’t have either of those Super Bowl caliber squads, but I believe this year’s defense has the potential to be better than the 2009 Cardinals; that’s certainly a good starting point. Besides, winning the NFC West for a third straight year is job number one. Speaking of the Chicago Bears, it pays, but also really hurts, to remember the “they are who we thought they were” Monday Night Football game in October 2006; you know which one. The reason I bring that laughable nightmare up is because it was Leinart’s most important start to that point. The Cardinals were up against the 5-0, Super Bowl favorite Bears. Without Larry Fitzgerald (hamstring) and with little help from Edgerrin James (55 yds on 36 carries with 0 TDs and a key fumble), Leinart put up an excellent 24/42, 232 yds, 2 TDs, and 0 INT line against an outstanding defense and a team that had outscored its opponents 77-13 over the previous two games. Leinart spread the ball around to seven different receivers and staked his team to a 20-0 halftime lead. 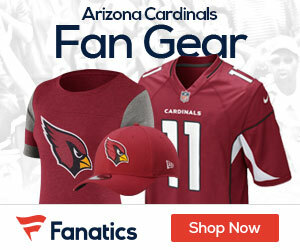 Even after a historic meltdown that had nothing to do with Matt himself, Leinart put the Cardinals in position for a game winning field goal with under a minute to play; it wasn’t meant to be. After the game, Brian Urlacher noted, “[Leinart’s] a good quarterback. He’s young, we tried to throw a lot of stuff at him. He took care of the football, didn’t have any interceptions.” You really couldn’t have asked for more. I still wouldn’t ask for more than what he showed in that game as Leinart is about rewrite the biggest start of his career stats when the NFL schedule finally hits Week 1. While some are so busy wringing their hands about Leinart they may have overlooked a few important things. First, the Cardinals have a drastically improved running game with Beanie Wells and Tim Hightower; and I mean drastically improved. 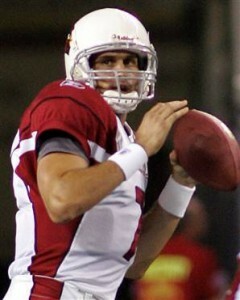 That will instantly make Leinart a more effective quarterback than he otherwise would be. Second, the Cardinals have a much more talented, cohesive, experienced, and deep offensive line. Levi Brown, however, has to play better and make this the year he finally puts it all together. Third, whether you want to believe it or not, I believe Ken Whisenhunt when he says Leinart is more mature as a person and a football player. Finally, and perhaps most importantly, the culture in Arizona has changed dramatically in the span of three years. If you’re not a long time Cardinals fan, it’s almost impossible to fully appreciate the transformation from a perennial joke to a division favorite. Although the Cards are notorious for sometimes playing down to weaker teams, they are no longer shocked to find themselves winning, which in the past prompted them to throw their progress down the drain. The Cardinals now expect to win games and their division for that matter, even if the 49ers are the trendy pick this year. The NFC West is the Cardinals’ division until the 49ers (or Seahawks, sorry Rams) prove otherwise. That’s the benefit a team gets from winning. You’re the division champions until you’re not. Does all this mean that I’m a card carrying believer in Leinart’s abilities? Well I’m not going to bet that he’ll make the Pro Bowl, but if Leinart keeps the interceptions down and takes care of the ball like Urlacher noted there are enough weapons on offense to allow me to continue to feel better and better. The bottom line seems to be that Leinart has won before and he may very well become a winner again. He won’t be Kurt Warner, but c’mon, he won’t be JaMarcus Russell either. I wrote this on azcentral and I’ll write it again. If the Jets can go 9-7 and make it to the conference championships with Mark Sanchez, then so can the cards with Leinart. But they’ll need a really good running game & a great defense (like the 09 Jets). And like you pointed out, our running has really improved and we have more talent on defense. If both could live up to their potential, we’ll be in the playoffs for a 3rd straight year. Your point about Sanchez is well taken and I also believe the Cards’ defense has the potential to improve drastically this year, but the ’09 Jets defense is probably an unfair goal for the team.